Value Proposition summarizes the reason to buy a product/service, convincing a prospective customer that it will add more value or better solve a problem than the competition. Defining your value proposition is like catching a monkey by the tail. To help you with this elusive task, I have created the Value Proposition Matrix. The idea is to focus on the criteria that have importance (left column) and evaluate them by who determines their value (top row). I have set out the matrix, reading from left to right, from production to use, but you may want to start on the right to be sure what kind of experience you are aim to deliver to your customer, and then work back. Your criteria may be somewhat different—make sure that you are evaluating the right ones for you. Then use the value proposition matrix to test their strength or importance right across the value chain. You can even give the values different weights. For example, if ‘time’ is a complete prerequisite for the customer, then it should carry more weight than for other people in the chain. You can only deliver powerful value to your customers if you ensure that value does not dribble between the slats separating each stage of the value chain. There needs to be strong alignment between all the people who impact the delivery of the final product to the customer. 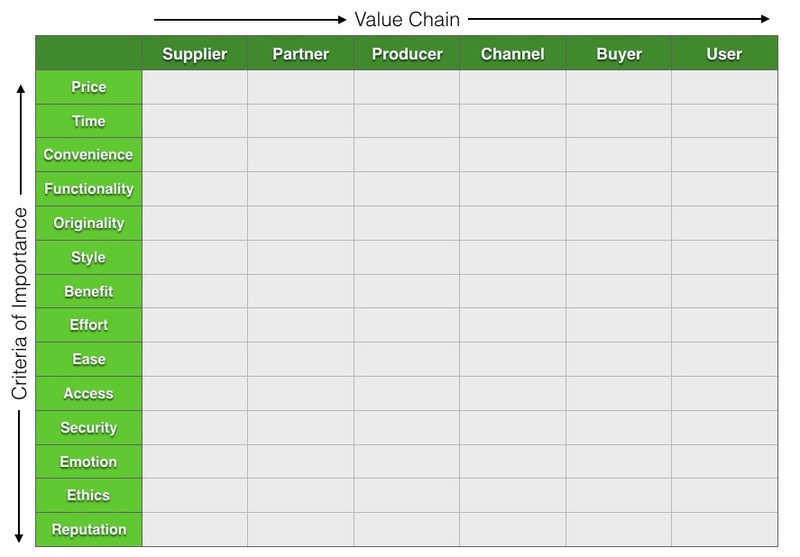 The value proposition matrix is designed to show you the weak and strong links in the chain. Competitive Offers: You can replicate the process with all the competitive offers you can identify. You will sharpen your own value proposition, by comparing its relative performance against others, by using the value proposition matrix. When I started my main business in the 80s, we had difficulty in doing this analysis because we were offering something in the relatively empty waters of the ‘Blue Ocean‘, rather than in the crowded ‘Red Ocean’. However the clients’ dollars were nonetheless being spent. If we had pretended that what we offered was unique and had no competition we would have been deluding ourselves. Every offer has a counter offer.